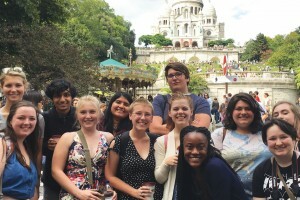 First-year Centenary students enjoy Paris in August 2017. SHREVEPORT, LA — For the second year in a row, Centenary College has been recognized as the baccalaureate institution with the highest percentage of undergraduates participating in study abroad programs. The Institute of International Education (IIE) compiles this data on international study in its annual Open Doors Report, based on a survey of approximately 3,000 accredited colleges and universities in the United States. The 2017 Open Doors Report revealed that more than 300,000 American students received academic credit for study abroad experiences in the 2015-2016 academic year, an increase of four percent from the previous year. During that time period, 212 Centenary students participated in a variety of study-abroad programs, including the College’s signature Centenary in Paris experience for all first-year students, semester-long exchanges with partner universities in Belgium and France, and immersive May Module courses. Centenary has recently offered faculty-led immersive courses in Argentina, Australia, Denmark, Finland, France, Greece, Haiti, India, Nicaragua, and South Africa. Centenary has made international study an academic priority and supports several programs that make it possible for students to study abroad more than once during their college careers. The Centenary in Paris experience is included in tuition, and the College’s Passport Points program helps fund additional international travel. As a result, Centenary’s estimated participation in study abroad is 184.3%, an impressive statistic that is not only 44 percentage points higher than the #2 baccalaureate institution, Agnes Scott College, but also significantly higher than the top-ranking institutions in the masters-granting and doctoral-granting categories. Centenary Dean of Students Mark Miller directs the Centenary in Paris program and has the chance to see first-hand how international study and travel positively affects students. “Diversity and global learning, including study abroad, is one of 11 high-impact teaching and learning practices that have been shown to be particularly beneficial to a wide range of college students, particularly historically underserved students,” says Miller. “Study abroad has proven to have a positive relationship to student engagement. Open Doors is published by the Institute of International Education (IIE), which has conducted an annual statistical survey on international students in the United States since its founding in 1919 and in partnership with the U.S. Department of State’s Bureau of Education and Cultural Affairs since 1972. Open Doors is a comprehensive information resource on international students and scholars studying or teaching at higher education institutions in the United States, and U.S. students studying abroad for academic credit at their home colleges or universities. The research is supported by a grant from the Bureau of Educational and Cultural Affairs at the U.S. Department of State. Further details on the Open Doors 2017 surveys and their findings is on the Open Doors website.